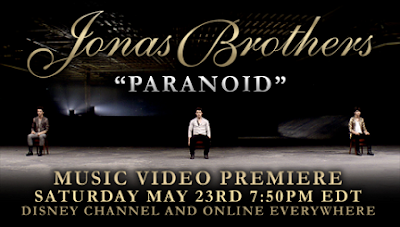 Jonas Brothers Fandemonium: 'Paranoid' Music Video May 23rd! 'Paranoid' Music Video May 23rd! Listen to the OFFICIAL "Fly With Me'' NOW! New ''Nick's Simple Wins" Blog Entry! Happy 1st Birthday Elvis Jonas!! REMINDER: 2nd Jonas Brothers Web Chat Today! Jonas Brothers Newest SayNow Message! Friends for a Change: "Send It On"
Paranoid Music Video to Air Tonight! Jonas Brothers Live Chat - May 28th! Santiago, Chile - YOU ARE WONDERFUL! The Jonas Brothers are in the UK! New Kevin Jonas Disney Channel Bumper! JONAS PREMIERES TONIGHT ON THE DISNEY CHANNEL! A Jonas Caught in the Act!